Q: What do I do when I get an error that reads "cannot authenticate to the server," or a pop up that wants me to put in my username and password? 1. If you get a pop up that looks like the image below. Click cancel and follow the steps below. 2. 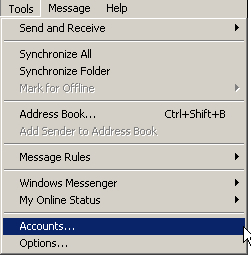 In Outlook Express, go to the Tools in the top menu, and select Accounts from the drop down menu. A box will appear called "Internet Accounts". 3. 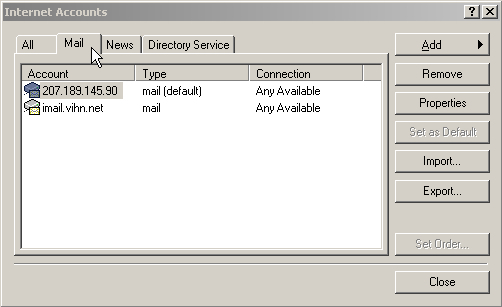 Once in "Internet Accounts" you will need single click the mail tab and then double click the account your using. After doing this the "Properties" Dialog box will open up. 4. Once in the Properties box, you will need to check a couple things. B. Check and see if your account name and password are correct. C. Look and see that remember password is checked. 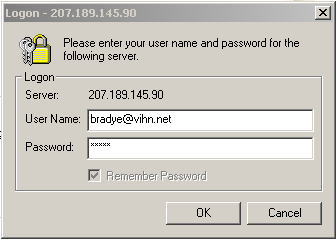 D. Lastly, make sure that "My server requires authentication" is checked. 4. 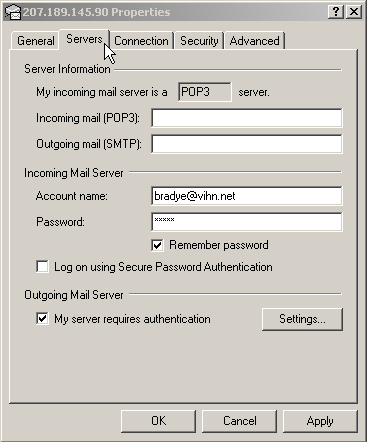 Once these are checked press OK and get back to the main area in Outlook. Click the send and receive icon to see if the error continues. If the error occurs again contact support at 1-866-468-8446.